JD Peterson introduces a lunatic epic poem parody of Homer's Odyssey that occurs on a distant planet called Orn. This tiny planet, hidden in a corner of our (or some other) galaxy, is a subject of modest debate among Earth’s xenohistorians. Only a select few on Earth (individuals who prefer to remain anonymous) know much about this planet, and researchers have discovered a rich body of Ornian literature that seems to have had a significant influence on the myths and legends of Earth. Indeed, we know that Ornians have visited Earth for thousands of years, exchanging tales with a few of our most famous early historians as well as with more contemporary writers. Ernest Hemingway himself is rumored to have said, “An intelligent man is sometimes forced to be drunk to spend time with Ornians.” And Groucho Marx was heard to say, “Well, Orn is Orn, isn't it? Still, on the other hand, water is water. And east is east and west is west and if you take cranberries and stew them like applesauce they taste much more like prunes than rhubarb does.” Of course, these quotes have been changed by those who either didn’t hear them correctly or don’t believe in Orn. Nevertheless, the titles of some of JP Homer's early discovered works include "Of Dar Mofts and Men", "The Guy Who Killed His Father and Married His Mother", "The Wizard of Orn", "War and Peas", "Alice in Underwhere", and "The Thesoddy", as well as dozens of others with themes or titles that often appear similar to later Earthly writings. The author translated The Thesoddy after he discovered a very old copy in an abandoned house in Boston, Massachusetts. It had apparently been used to line exotic bird cages, adding some additional challenges in the translation of this material from ancient Ornian, which is apparently similar to Pig-Latin. If you have ever read the Odyssey and enjoy parody, then get set for this tale of Thesod of Freeny. He is sent on a long adventure to find the Goddess Afrodainty to try to save his country, encountering horrible storms, sea monsters, heroic swordplay, witches and sorceresses, angry Gods, crazy nomads, a beautiful princess, helpful dwarves, amnesia, and lunatic humor. With only a silly band of green, large-nosed dar mofts as a crew and a ship made of lead, Thesod uses wit, courage, and a lot of luck to get to his journey's end. But beware! You may never be the same after encountering he zany humor, bad puns, crazy rhymes, and general lunacy, Did this tale, written thousands of years before Earth’s recorded history, in?uence our own Homer’s Odyssey? You can decide. At any rate, J.P. Homer’s tales are shining examples of the literature of Orn without which we would not have as much literature from Orn. Little is known about the strange & mysterious J.D. Peterson, author of "The Thesoddy" and "Erik Miteus". Somewhat unreliable sources suggest that J.D. Peterson was born sometime between 1945 and 1971, or maybe earlier or later. His real name may be Jefferson Davis Pernoste, another noted (and largely unknown) xenohistorian (a specialist in the history of alien cultures). However, his xenohistorian peers, a strange crowd themselves, think that his real name may be J.P. Homer, a 16,000 year old immigrant from the planet Orn that he writes about so fondly. More critical colleagues suggest that J.D. Peterson is a dar moft, which may explain why nobody has ever seen or met the guy. The big nose & green skin would probably give him away. Of course others think he’s just some nutty writer. His career as a self-proclaimed xenohistorian is similarly shrouded in mystery, but it probably began back in 1979 when he says he found “The Thesoddy” in the attic of an old, abandoned house in Boston, Massachusetts. According to J.D. Peterson, the work was clearly written by aliens, because he found it in the original Ornian symbols and it said "From Planet Orn" at the top. Unfortunately, this alien document was used to line several bird cages, making the translation very unpleasant. But this incredible discovery started J.D. Peterson on a nearly 30 year obsessive hunt for more evidence of planet Orn, culminating in the recent discovery of "Erik Miteus", which was encased in concrete on the bottom of Lake Michigan. JD Peterson is committed to continuing his publication of Ornian histories, claiming that "having them all in one place makes them both easier to read and easier to avoid, depending upon your perspective". Perhaps the future holds more discoveries of their works (in trash cans, hidden between walls, or stuffed in the toes of oversized boots) and will allow thousands or millions of people to be able to read them or avoid them more easily. 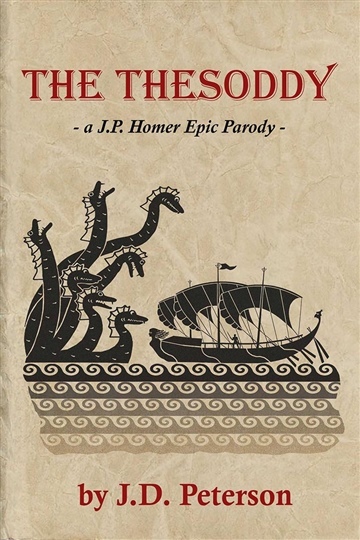 The Thesoddy by JD Peterson is a crazy version of Homer's Odyssey set on a distant planet with a lot of crazily named people and creatures. It starts with an introduction to this world and the writer who is being 'translated' in the story to give us a little context about the history surrounding this lost work. We meet Thesod, who is going on a great journey and encountering a huge number of different places and events on his quest, some of which are more entertaining than others. The narrative also contains a great number of entertaining pictures about this alien world where the story is taking place that really bring it to life.The only part that took a while to get used to was that everything rhymed, which made it a little bit sillier and over-the-top than the author might have necessarily needed. Throughout the work, there are a lot of footnotes and superscripts that redirect the reader to inside jokes that the author is making, and they are perhaps the most entertaining aspect of the entire work. They are well written and contribute to the overall story, making it feel authentic and preposterous at the same time. It was very entertaining to read this story, and several parts of it were very funny in how they recreated events from the actual epic it is satirizing. There were some passages and pictures that blew me away with how detailed and impressive they were, paying very close attention to detail in creating the fiction while staying true to the original. The Thesoddy by JD Peterson makes a few missteps in storytelling, but it is a thoroughly rewarding and enjoyable read.